Users of a new Ustream application will be able to broadcast on their Facebook Timelines live video they shoot with their iPhones. The iPhone app, which will be unveiled on Thursday, is called Broadcast for Friends (BFF) and is expected to appear in the Apple App Store soon, once Apple approves it. Broadcast for Friends will also work with iPads. Application users can apply pre-configured filters to alter the colors and mood of the video. The broadcasts don't have a time limit. The free application can be used, for example, to broadcast wedding ceremonies, public meetings, artistic performances, parties and the like. Ustream doesn't plan to display ads with the application. Viewers can send comments in real time to the broadcaster. Users can set different access levels for their broadcasts, including making them available to their Facebook friends, to themselves only, or to everyone. 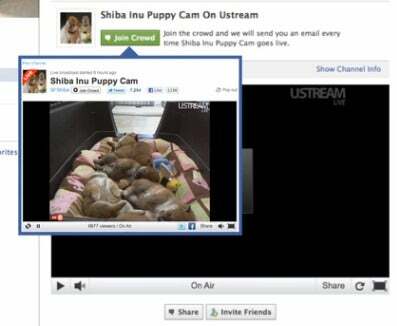 Users can also save a recording of the broadcast so it can be viewed later on demand on their Facebook Timeline. Ustream said its infrastructure and technology will allow it to handle millions of simultaneous broadcasts. The application brings together three popular Internet trends -- mobile, video and social networking -- and, if popular, it could help Facebook improve what some consider a currently subpar set of mobile functionality. Ustream already has an application that lets users of iPhones, iPods and iPads, as well as Android smartphones, broadcast live video from their devices to their Ustream channel. The Ustream channel can be viewed on the Web or on Ustream's mobile applications. This application requires that users create a Ustream account. However, this new BFF application runs independent of the Ustream website. Users do not need a Ustream account nor a Ustream channel. Users only need to download the BFF application, connect it to their Facebook account and they can start broadcasting video from their iPhone.